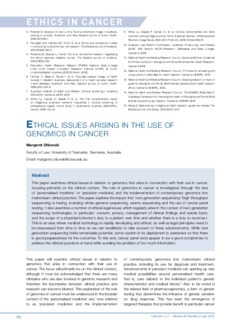 This paper examines ethical issues in relation to genomics that arise in connection with their use in cancer, focusing primarily on the clinical context. The role of genomics in cancer is investigated through the lens of 'personalised medicine' or 'precision medicine: and the implementation of contemporary genomics into mainstream clinical practice. The paper explores the impact that 'next generation sequencing' (high throughput sequencing) is having, including whole genome sequencing, exome sequencing and the use of cancer panel testing. It also examines a number of ethical-legal issues which regularly arise in the context of next generation sequencing technologies, in particular: consent; privacy; management of clinical findings and results back; and the scope of a physician's/doctor's duty to a patient over time and whether there is a duty to recontact. This is an area where medical technology is rapidly developing and ethical, as well as legal principles need to be reassessed from time to time so we can recalibrate to take account of these advancements. While next generation sequencing holds remarkable potential, some caution in its deployment is warranted so that there is good preparedness for the outcomes. To this end, cancer panel tests appear to be a good compromise to address the clinical questions at hand while avoiding the problem of too much information.